The passes in the northern Dolomites like those of the Sellaronda and the Giau are very well known and therefore full of traffic and tourists. Just a bit further south almost all tourists have disappeared, for example at the Passo Duran, while the mountains, also being Dolomites, are almost as impressive. 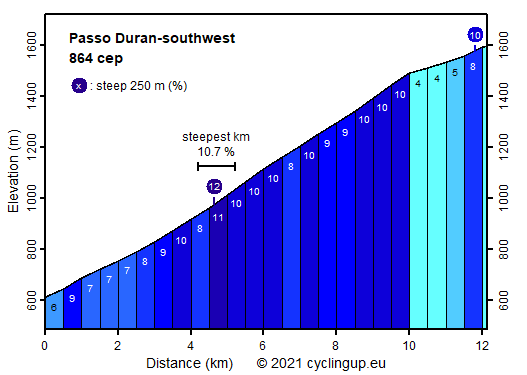 The ascent from the southwest to the Passo Duran starts in Àgordo. The ride is varied with villages in the first three kilometers and loneliness afterwards. The road is winding. The climb is pretty tough mainly because of the part between kilometer three and ten, which has an inclination of 9.5% on average. It is, however, nowhere much steeper than 9.5% as the 12% of the steepest 250 meter section show. The most beautiful kilometers are the final two, where the road is more narrow and less steep (4-8%), and where the rugged, surrounding mountains are clearly visible.